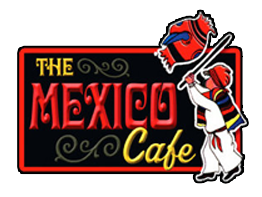 Try one of our famous "Original Mexico Cafe" Margaritas!!! HAPPY HOUR 4:30-7 PM SUN-THUR! PATIO AND BAR AREA ONLY. Our "Original Margarita" mix with Apple Pucker. Our "Original Margarita" mix with Christian Brothers Brandy and Sauza Hornitos Tequila. Our "Original Margarita" mix with Bols Blue Curacao and Sauza Hornitos Tequila. Our "Original Margarita" mix with Jose Cuervo and Gran Gala. Our "Original Margarita" mix with Disaronno. Our "Original Margarita" mix with Midori Melon. Our "Original Margarita" mix with Gran Gala, Jose Cuervo and cranberry juice. Our "Original Margarita" mix with Bols Pomegranate. Our "Original Margarita" mix with 1800 Silver Tequila and Chambord Raspberry. Our "Original Margarita" mix with Dekuyper Watermelon Pucker. Our "Original Margarita" mix with strawberry, A crowd favorite! Corn chips and beans topped with melted cheese, green chiles and guacamole. Flour tortilla with melted cheese and guacamole on the side. Homemade creamy goodness, mixed with special spices. Nachos with added tomatoes, onions, olives and sour cream. Flour tortilla with choice of steak or chicken, onions, bell pepper, tomatoes and melted cheese with guacamole and sour cream. Choice of beef or chicken and cheese, wrapped in a flour tortilla and deep fried. Served with guacamole and sour cream. Flour tortilla, beans, cheese, green chiles, tomatoes and olives. Served with guacamole and sour cream. Meatball soup in a bowl or cup. Shredded chicken and rice in chicken broth. A traditional Mexican dish made with beef in a clear broth. Mixed green salad with diced chicken, cheese, tomatoes, hard boiled egg, olive and pickles. Served with onions, bell peppers and tomatoes, severd over a bed of lettuce. Topped with avocado slices and cotija cheese. Have it with Grilled chicken or steak. A handmade large flour tortilla shell, beans, lettuce, cheese, tomatoes, olives, guacamole and sour cream. Served with either shredded or spicy beef or chicken. Romaine lettuce topped with parmesan cheese and traditional caesar dressing. Served with rice, beans and tortillas. Choice of soup or salad. Non-sizzling plates upon request. Tender strips of top sirloin served with beans and rice. Tortillas on request. Boned chicken in a thick, rich, red sauce. Served with rice, beans and tortillas. Top sirloin steak and two cheese enchiladas. Top sirloin, served with your choice of rice and beans or fries. Shredded beef, onion, and green chile tomato with scrambled eggs. Tortillas on request. Mexican beef and pork sausage, onions with scrambled eggs. Tortillas on request. Two eggs covered with spicy onion and chile sauce. Tortillas on request. Two eggs covered with pork and green chile sauce. Tortillas on request. Cheese enchiladas topped with two friend eggs. Tortillas on request. Top sirloin steak, served with two eggs. Tortillas on request.